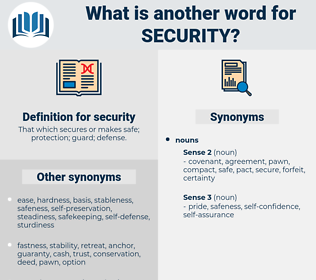 What is another word for security? 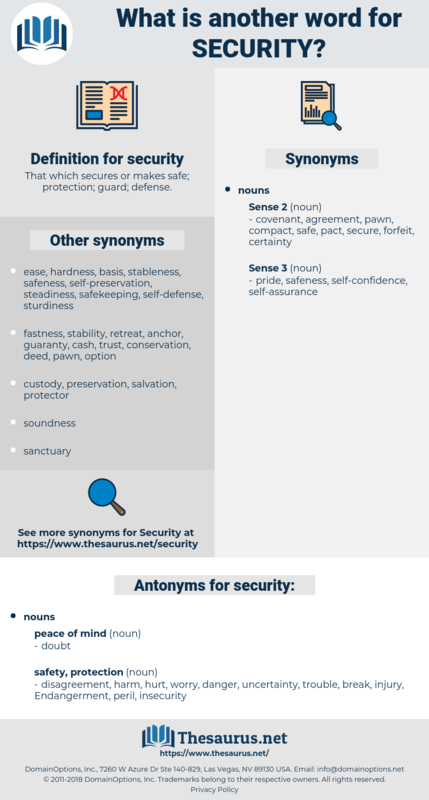 That which secures or makes safe; protection; guard; defense. light at end of tunnel. agreements, matters, concerns, requirements, Measures, Facilities, officers, procedures, benefits, payments, expresses, networks, Injuries, Charges, documents, data, obligations, nations, cars, expenses, weapons, women, makes, meetings, guarantee, Guarantees, secure. guarantee, secure, dependability, reassurance, securitization, safety-related, continuity. Provided, transmitted, said, added, backed. disagreement, harm, hurt, worry, danger, uncertainty, trouble, break, injury, Endangerment, peril, insecurity. risk, Vulnerableness, vulnerability, exposure, susceptibility, liability, violability, offensive, openness, threat, susceptibleness. An assurance company with whom the firm had dealings was quite ready to advance the money on the proposed security, and at the proposed rate of interest, but in such a matter as that, Rubb and Mackenzie did not wish to deal with an assurance company. You could take those who have social security cards and references. square root, surtout, serried, sciaridae, shredded, serrate, square-toed, sortie, skyward, squirt, share-out, score out, shard, scrod, sort, screed, serrated, sherd, sordid, shrewd, shred, surd, shirty, susurrate, shortia, secrete, sherwood, secured, sheared, skirt, sugar daddy, sacred, saccharide, sciuridae, sciarid, sawwort, seaworthy, Sorehead, shroud, sorority, squash court, shared, sarda, squaw root, swear out, squared, shirt, Serratia, show card, see red, sigurd, seaward, sisyridae, sward, squawroot, sorted, swarthy, sore-eyed, sayeret, swertia, soured, scarred, sard, short, sourwood, schrod, swart, saucer-eyed, shared out, seagirt, skirret, square yard, suharto, secret, seared, short-headed, scared, shore duty, sierra redwood, scoured, sewer rat, showerhead, squared-toe, shaggy-haired, sugared, swearword, sea squirt, short-dated, scaridae, sash cord, seurat, sort out, sword, surety, seward, Swiss Chard. hedge, hedging, easy street, insurance. protection, public security, shelter, peace, secureness.